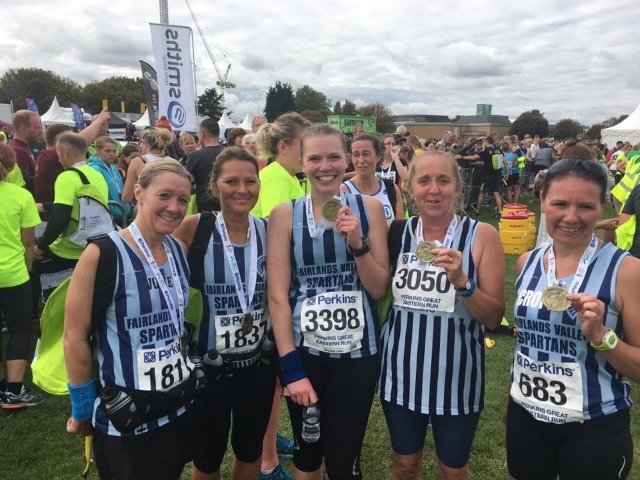 Seventeen Spartans raced around Peterborough in the Perkins Great Eastern Run half marathon and many achieved new personal bests, hit new targets, got under two hours for the first time and were running 13.1 miles for the first time. DANNY HUKIN was running his first half marathon race since knee surgery. He set himself a target of 1 hour 30 minutes and was very happy with a 1:27:43 finish time. ERICA GRAYSON got under two hours for the first time, knocking 15 minutes off her half marathon personal best (PB) this year to finish in 1:59:51. She was joined by MICHAEL ANDREWS who ran his first ever half marathon in 1:59:48. Despite already having a good time SUZY HAWKINS squeezed another 14 seconds off hers and finished in 1:33:45. STUART HAYCROFT continued his run of achieving a PB for every race of the year with 1:27:45, beating his previous Half Marathon PB by just under six minutes. GREG KELLY who trimmed 3:31 off his PB when he ran in with 1:48:11. BARRY KING ran with his brother STEVE KING who took almost 20 minutes off his PB time! They finished in 2:07:29. JIM BROWN ran his fastest half marathon since 2010 having had major surgery in 2011 and 2015. His 1:44:02 gives him an age related score well over 70%. VERITY FISHER and ANN TRYSSESOONE were under two hours with 1:58:23 and 1:58:56. DANIEL SUTTON came with 2:00:44; KAREN ELLIS and JULIE SHADBOLT with 2:01:54; SHARON CROWLEY in a season’s best 2:06:34; and CAROLINE CROFT with 2:10:30. PAUL HOLGATE ran round with his daughter in her first half marathon, they finished in 2 hours 48 minutes. 232 STUART HAYCROFT 1:27:45 PB (5:46). PAUL HEWETT ran the Herts 10K in a time of 38 mins 22 seconds. He was 23rd out of 1789. JENNY PAUL did The Ridgeway Run, organised by Tring Running Club. It was nine miles of hilly trail with great views from the tops. Her time of 1:39:39 was thirteen minutes quicker than last year. Super veteran PETER CARPENTER ran the Wimpole Hall 10 mile event. He reckons he was doing reasonably well to the 8 mile point, but then it was a struggle for the last two miles, including a couple of brief stops in the last mile in what was really a meadow. He was pleased to just finish in less than two hours with 1:59:20 for the scenic cross country course. Maddie Pritchard and John Harris ran the Norton 5k on Saturday. John was eighth with 20:30 and Maddie 27th with 23:18. TOM SAUKA did the Langdale Horseshoe fell race on Saturday. It was wet and forecast for rain all day so he prepared for the worst. It was very wet and boggy all through the race and he spent a lot of it knee deep in it or slipping over on the grassy down hills, but it was a great atmosphere as one of the classic fell races with a lot of the top names there. He finished in 3 hours 52 minutes 6 seconds. York is one of the biggest and best organised UK marathons. On an undulating course mainly to the East of York, ROGER BIGGS completed the 26.2 miles in 5:05:42. ANTHONY BLYTH completed his first run as a Spartan at the weekend! It was the Royal Parks Half with a time of 1:35:28. He was fund raising running for the Great Ormond Street Hospital. It was a quiet week with a number of Spartans expected to be in action at the Great Eastern Half Marathon in Peterborough. CRAIG HALSEY followed up his recent outstanding Berlin Marathon performance by showing there’s nothing wrong with his current speed at shorter distances either. He was first to finish at Stevenage parkrun in 16:51, matching his course best. MARK BEASLEY was next Spartan man home in 22:22 in 30th position and MARTIN DUDLEY finished in 22:36. CHRIS HOLLAND (23:30), RYAN DUNNING (24:06), SIMON SYPULA (24:39), LEE PICKERSGILL (24:39), DAVID SCOTT (25:07) and JAMES SOUTH (28:01) also ran. For the ladies RUTH REILLY was second finisher at Stevenage in a new course PB time of 22:00. KELLY EVANS was 9th in 25:05 and CAROL PAUL 14th in 26:32. TRACY PEZ also finished top 30 (23rd in 27:30) and was joined by KAREN PALMER (28:37) and SALLY PHILLIPS in a new course PB time of 29:46. PAUL MAGUIRE chose to run in Stratford-Upon-Avon on parkrun’s 13th birthday and ran an excellent new 5k PB of 20:56 to finish in 23rd position. Elsewhere MARK GOODWIN was 26th finisher at Panshanger in 22:37 and VERITY FISHER was at Rutland Water, finishing in 47:46. Finally ROGER HARDMAN was again in action in Newcastle, finishing in 27:42. Serpentine 25th Anniversary 5K from the boat house on Friday 27th October. Fred Hughes 10 miles inc senior championships at St. Albans on Sunday 21st January.